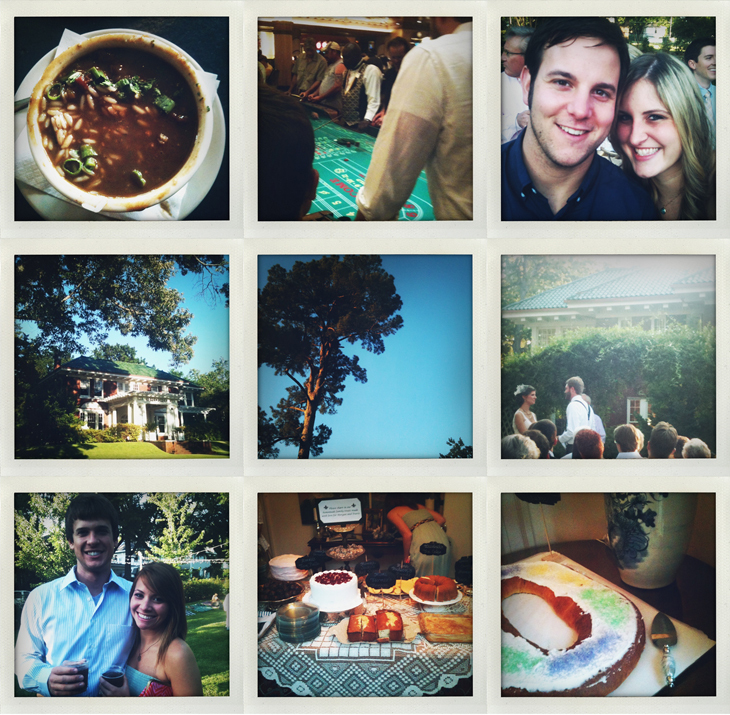 Greg and I went to the sweetest Louisiana wedding this weekend. Friends of ours, Travis + Morgan, got married in the backyard of a beautiful Shreveport mansion, built in 1903. There were drinks during the ceremony, yummy king cake, a zydeco band, flip cup (yes! flip cup at a wedding, so much fun), lots of love in the air and some of the best wedding food I've ever had (crawfish etouffee, shredded pork over rice, blackened catfish, hush puppies, & chicken and sausage gumbo!). We got to road trip there with Lauren + Blake and party with some great friends. Of course, I ran out of the house without my camera for the weekend though, bummer!, so here are some photos from my phone. How did you still get such great pics with no camera?? I don't get it.. talent.